Doing life with kids is lots of things – spontaneous, messy, fun, chaotic, time-intensive, joyful … Easy is not on that list. Any time I include my children in a task, it is so. much. more. exhausting! Even if it is wonderful, it is still extra questions (oh the questions! ), and extra mess (oh the laundry!). This holds true for our gardening endeavors, too. Now that we’re ramping up the seed-starting, I am so tempted to bust out my supplies after the kids are in bed and whip out a whole seed flat in no time. Organized, clean, complete. 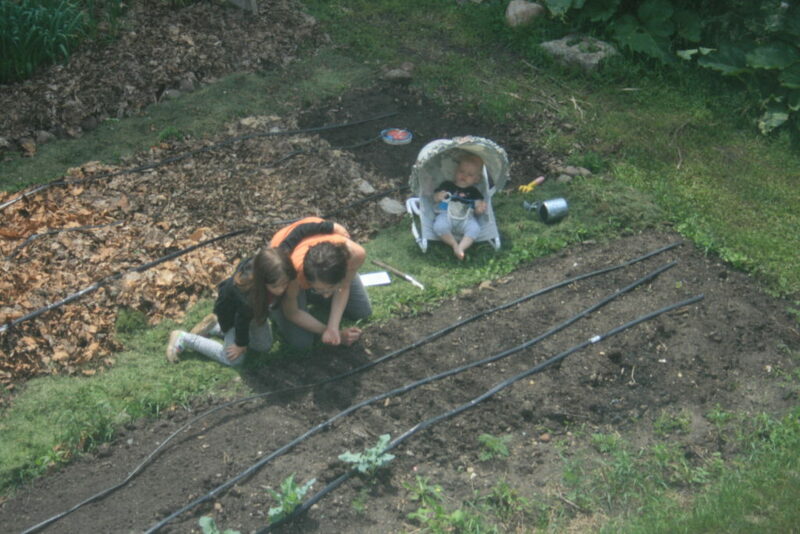 While the statement was not true at face value, it reflected a deep truth that affirmed for me all the effort and countless extra hours I take to include my children in growing our food. It demonstrated her excitement and personal discovery of the miracle of taking a tiny seed, nurturing it and harvesting our food from it (sometimes many pounds of food from one tiny seed)! This simple but profound experience creates a connectedness to our food, to the earth, to the worms, pollinators and our own healthy bodies that, I believe, is a really powerful tool in raising humans who will love, respect and care for all living things – themselves, others, animals, the environment. Equipping the future generation with this foundational approach to life gives me hope for the future. 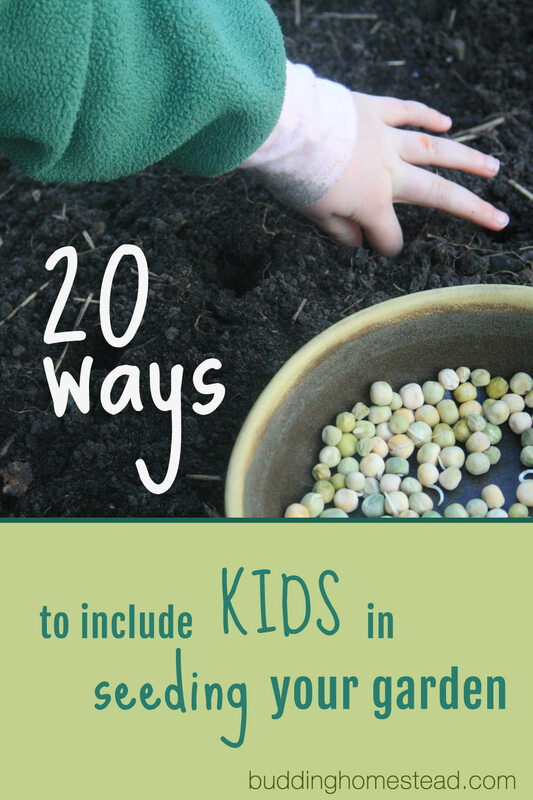 Here’s 20 ways to involve your children in seed-starting and planting your garden. It really is worth it. Ask for their opinion. Involve them in the decision-making and planning of your garden: What should we grow? Which varieties? How many broccoli plants? 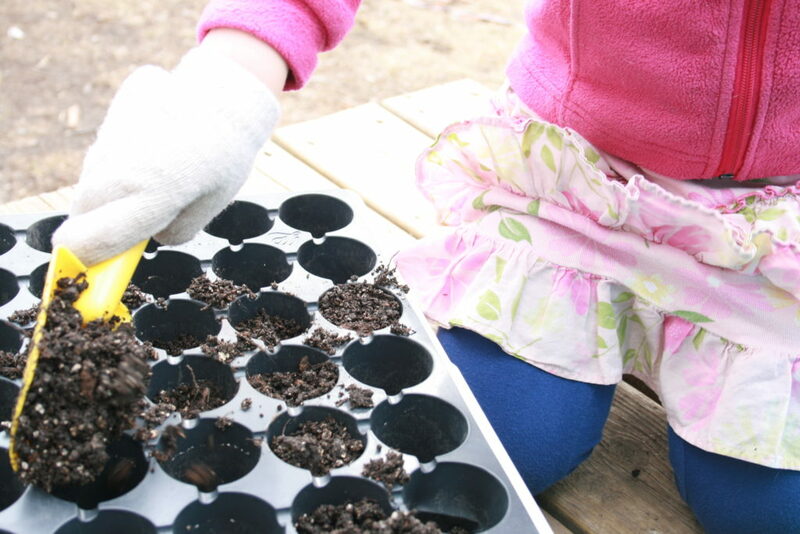 Allow the kids to fill all the seed-starting cells with soil. Mix your own seed-starting medium. You can pick up a bag of seedling soil at the garden store, but mixing your own is a lot more fun (let them stir and water!) and economical. Find my recipe here. 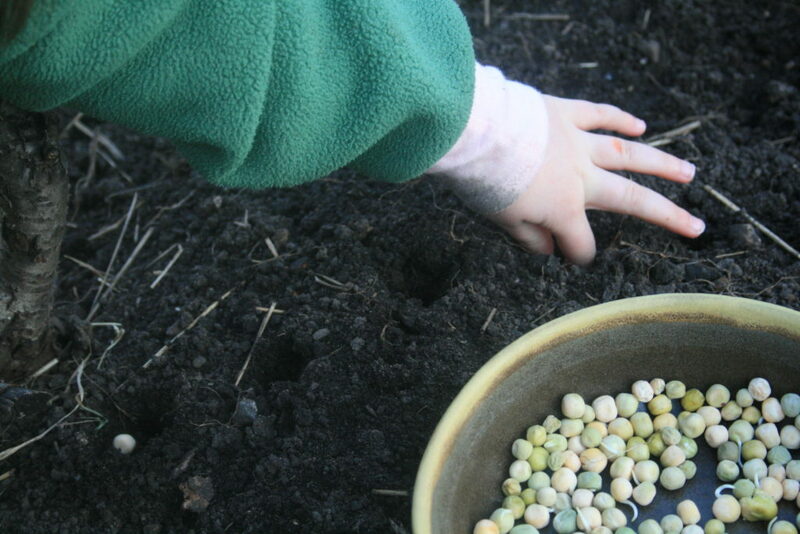 Allow kids to lay the seeds out in the seed flat, too. Some seeds, such as spinach are larger and perfect for the very little kids. 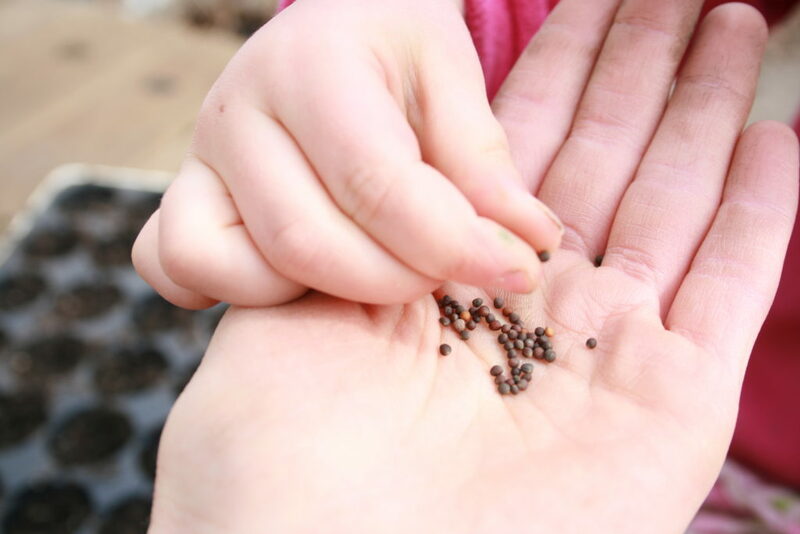 Other tiny seeds, like the brassica family, might be best for the older preschooler or elementary-aged kid. 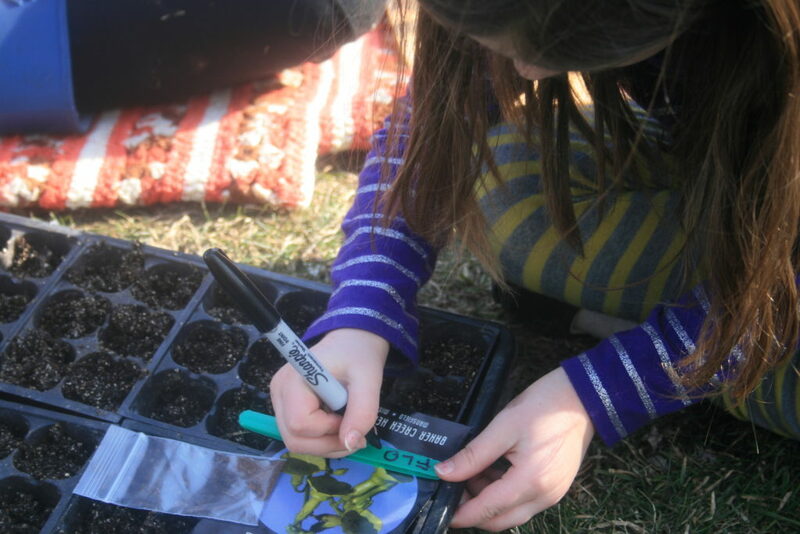 Once the seeds have sprouted, invite your child to thin out the seed flat with you. Leave just one healthy sprout in each cell, and pluck or snip the rest. Eating these tender sprouts is fun for kids and adults alike! 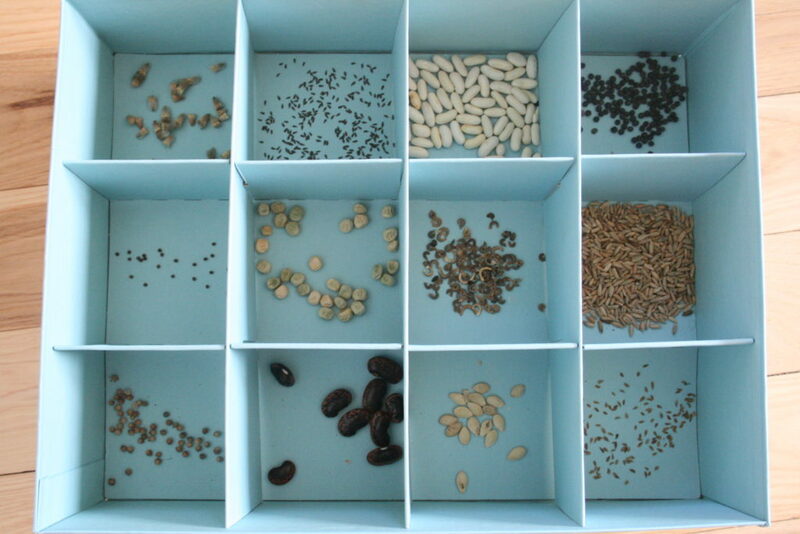 Use a bowl of mixed seeds as a Montessori sensorial sorting activity for your child. Have them divide the seeds into cups or compartments by likeness or color. Observe the different characteristics of the seeds and ask questions. Do small seeds grow small vegetables while big seeds grow big vegetables? Observation activities like these can spurn experiments or be a fun topic for another journal entry! Once your seedlings are ready for the outdoors, let the littles plunk the tender transplant into your hole. It’s a good opportunity to ooo and ahh over those amazing roots and practice being gentle! For those seeds that go right in the ground, poke a hole with a stick where you want the seed to go. Let the kids drop the seeds into the hole and backfill them. To learn which seeds can skip the seed-starting flat and go right in the ground, see my chart here. Section off a spot in your garden that belongs to your budding gardener. Let them own their garden by giving them choice in what to plant, while also being responsible for the work throughout the summer. 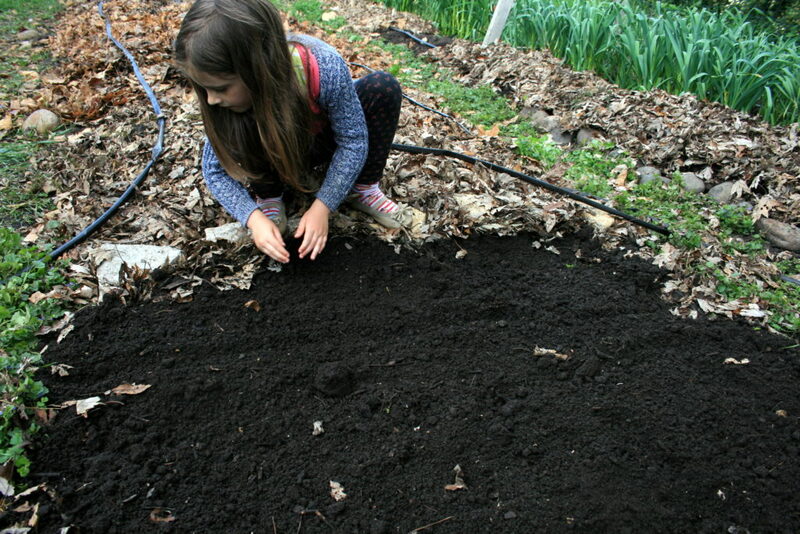 Allow the children to draw a furrow in the dirt with a stick for planting smaller seeds, like carrots. 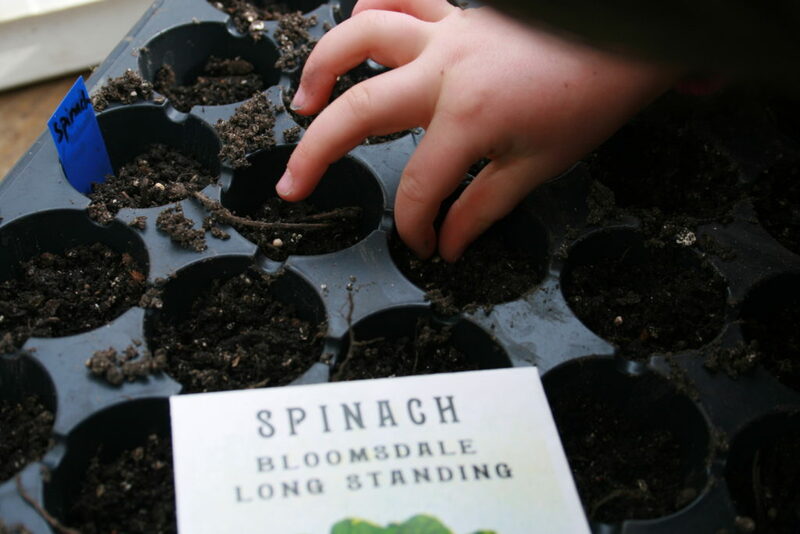 Empower an observant or older child with seed-starting jobs. A germination and/or moisture monitor makes daily checks to ensure moist soil until the seeds sprout. A grow light monitor ensures the seed-starting light is turned on each morning and turned off each night. Whether for outside or in your seed-starting flat, you will need some labels. When R was much younger, she made a squiggly line across the label, then I wrote in the name. Now, she practices writing ever-so-small on our labels! Provide nature journals for the kids and make a garden beginnings entry. Encouraging children to document your family activity, whether in words or pictures, is a priceless keepsake, great practice in writing, and fosters reflective habits. Have the children be in charge of the watering can. Aren’t those toddler watering cans a must-have?! 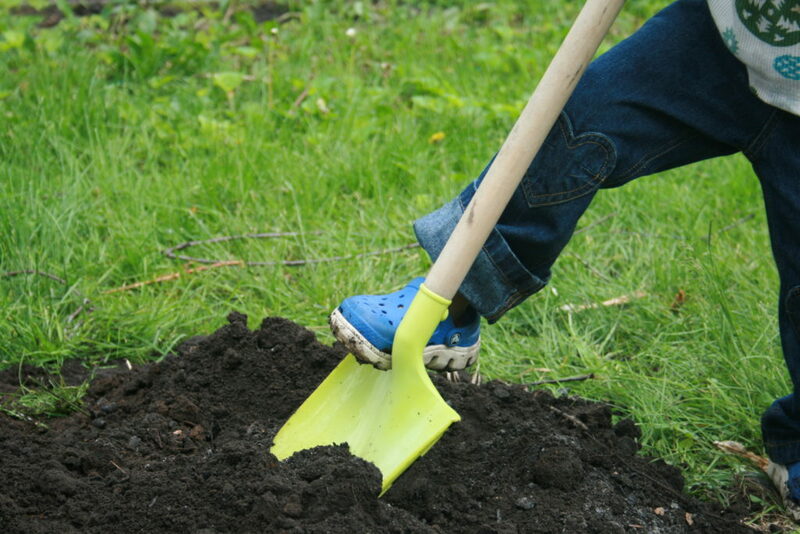 Let them wield their own shovel to mix that compost in. It really is more important than your ever-mounting pile of laundry! 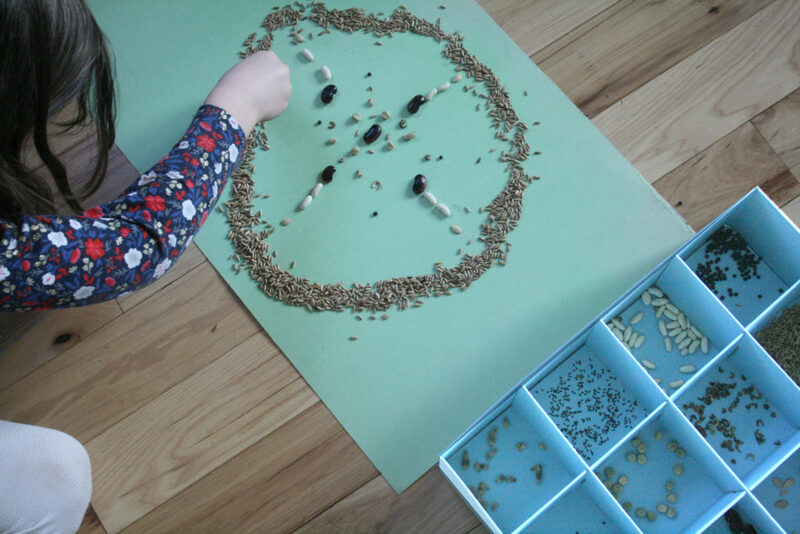 Ground their math practice by using seeds as manipulatives for grouping, counting, addition and more. Use those same seeds to create seed art. Host a seed swap event as a family to pass along your extra seeds and try some new varieties. In this way, you can buy just one seed packet, and trade the extra seeds in to have ten different seed types! 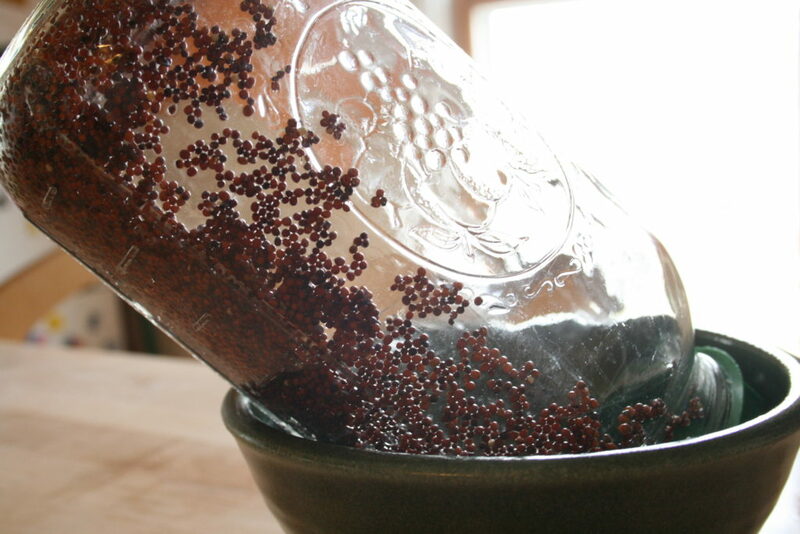 Sprouting seeds indoors can be done any time of year. It is a fascinating to watch the seed transform and uncurl it’s first shoot.